Hi! I’m Anni, and I’m the current research intern working with HKDCS. 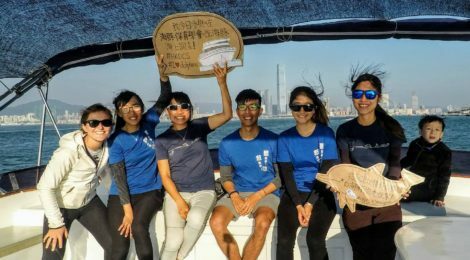 My backstory as to how I ended up working with the team may be a little different to other interns, as I’m not a biological/environmental sciences student, but it is based on the same passion for cetaceans and marine wildlife conservation shared by all researchers and interns who have worked with HKDCS. In this first blog post, I’d like to share my experiences working with the team, what I’ve learned, and what I get up to every day as a research intern! Since childhood, I have wanted to work in conservation. I wanted to help protect wildlife, preserve our oceans, and help educate people about the importance of these issues. It was such an important goal to me that I resigned from my job in the UK to start looking for opportunities to gain experience in the world of wildlife and cetacean conservation, which I can hopefully one day turn into a career. I came to Hong Kong to volunteer for the winter, and having read all about HKDCS internships online I contacted Dr. Hung to ask if he might consider taking me on so that I could learn from him and his team. To be honest, I didn’t expect him to give me a chance as I have no scientific background, but he wrote back to offer me an interview, and I was overjoyed to be given the opportunity. A few days later I was welcomed to the team as an intern! So the first thing to learn from my experience? It’s always worth giving these things a shot – if you care passionately about something then it’s never too late to go after it! Out on the boat with the HKDCS team! 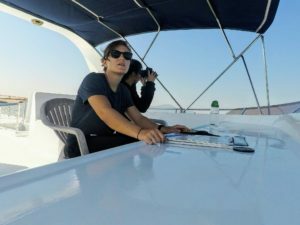 The first few weeks of the internship were spent shadowing different researchers during the line-transect surveys on the research vessel. 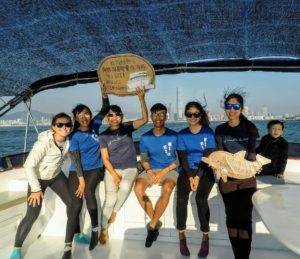 This involved joining the team on the boat each day as they surveyed different areas within Hong Kong waters for Chinese white dolphins and finless porpoises, the two resident species of cetacean in the region. We met early in the morning at different piers around Hong Kong to begin the surveys, and I would shadow the team of 3 or 4 researchers on the top deck of the vessel, watching them closely to learn their observation techniques, how data is recorded during the surveys, and what is involved in these line-transect surveys – one of the principal methods of data collection for the cetacean research project. 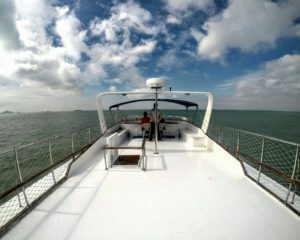 The view from the research vessel. This shadowing period was a great time to ask questions and build on my knowledge, learning from the team’s expertise and experience conducting research. 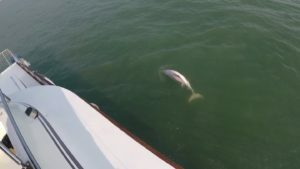 I was very lucky, as we had sightings nearly every time we went out to sea – there is nothing quite so breathtaking as watching Chinese white dolphins leaping out of the water (behaviour known as breaching), or seeing the glinting backs of the elusive finless porpoises as they roll in the waves to take a breath. The wonderful thing is, no matter how long the HKDCS team has been doing this, each of the researchers is just as excited by every new sighting as they were when they first started. The most amazing moment for me so far was when a group of juvenile and sub-adult dolphins began playing and chasing one another right next to our research vessel, giving us the chance to watch them at close range and appreciate their agility and sociable nature. It’s a joy you can’t get over, watching these fascinating animals in the wild. A playful Chinese white dolphin gets close up during our survey. I was taking in so much each day just by being there – getting to know the different survey areas, finding out more about the marine ecology of Hong Kong, understanding the research methodology and trends, learning what data is recorded and how to log it, getting to grips with using the GPS, and so much more. I was also picking up some basic Cantonese; learning words for ‘dolphin’, ‘porpoise’, and the numbers used to describe angles and measurements called out by the primary observer during a sighting! I also began to better understand the threats faced by the dolphins and porpoises residing here, and how they are affected by our activities. Some things took a little longer to get the hang of – I thought I would never get better at judging distances without the use of laser binoculars, and I was never quite sure how to gauge the Beaufort scale – the measure of conditions at sea. The team assured me it was just a matter of practice, practice, practice, and gradually my confidence grew. After three weeks of shadowing, I was watched closely by senior researchers on the team and they decided I was ready to go ‘on-effort’ – to take part in the research myself by rotating in on the positions of primary observer and data recorder during the surveys at sea, and by accompanying the team to do land-based surveys, office days, and public dolphin-watching trips. I can’t wait to tell you all about it and what I’ve learned since becoming a fully-fledged research intern, but you’ll have to wait for my next post in January, when I’ll be talking about life as a researcher, the threats faced by cetaceans in Hong Kong, and the steps being taken by the team at HKDCS to protect them.